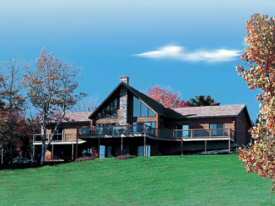 ﻿Mountaintop retreat, beautiful vistas. Licensed lodge with meeting and banquet room facilities; Hiking trails, horseshoes, firepits, basketball, playground, pool, outdoor hot tub, movies, coin laundry, dairy barn visits, llamas, horse-drawn wagon and sleigh rides, toboggans, snowshoes. Pets welcome. 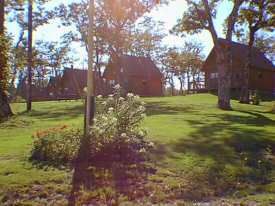 10 log chalets (1, 2 & 3 bedrooms), 4-pc bath (some with whirlpool), TV/VCR, radio, woodstove, fully-equipped kitchen, microwave, gas BBQ, handmade quilts, homemade jam; 5 rooms in lodge, continental breakfast available. Open year round. Located off route 256 on O. MacLean Rd., 12 kms west of Pictou. There are 10 chalets (1-, 2, & 3-bedroom) and are housekeeping units with fully-equipped kitchens (microwave, fridge and stove), living area with pull-out sofa beds and futons, TV/VCR (some with DVD), four piece bath (some with whirlpool tub), BBQ on deck. Chalets 1&2 are pet-free and all chalets are non-smoking. The licensed lodge has meeting room facilities and 5 private rooms with queen bed, four-piece bath, small dining set, TV/VCR, double pull-out sofa. Lodge rooms 1&2 are pet-free and non-smoking. Geocaching offered - please inquire! We have added our Rock Maple Retreat with 12 deluxe rooms - This charming new retreat is situated in a small stand of rock maple trees and faces out toward a spectacular view of the Northumberland Strait. The Rock Maple Retreat has 12 deluxe rooms with queen bed; kitchenette with bar fridge, microwave, and sink; four-piece bath with whirlpool tubs; double pull-out sofa; dining set; air conditioning, TV/DVD, deck with view. All rooms are pet-free and non-smoking. front with yet another spectacular view. Two rooms on the ground level are barrier-free (wheelchair accessible). large window facing the view.